George Graham Reviews The Diplomats' "Instrumental Action Soul"
There is music that says important things. There is music that strives to be innovative sonically, compositionally or that brings together novel blends of influences. And, there is music that is just for having fun. Most pop music is in the latter category, though much of the time it pretends to be something more significant than it is, or is patently exploitative. But this week we have an album that is just plain fun. It doesn't have anything to say, since there are no lyrics, and as far as innovation is concerned, the record is unabashedly retro, wearing its influences on its sleeve. Still, it comes off as a really worthwhile recording for its combination of good musicianship and lack of pretense. It's by an Iowa City based quartet who call themselves The Diplomats of Solid Sound, and they named their CD Instrumental Action Soul. The whimsical name of the group and album provides a clue as to what these clever players are up to: they re-create some of the instrumental styles of the 1960s with the emphasis on soul and R&B, including strong hints of Booker T. and the MGs, plus bits of surf music, soundtracks from detective movies like Shaft, and tunes that one would expect to hear as the backdrop to a mod fashion show. It's fun music, but I would hesitate to call it lightweight, since the quartet lay down some great grooves, and really manage to get the sound right, without going overboard. They are not afraid to mix up styles a little, and yet sound more genuine than most of the young retro groups that are appearing who attempt authentic recreations. The Diplomats of Solid Sound consist of guitarist and chief composer Doug Roberson, keyboard man Nate Basinger, bassist Dustin Conner and drummer Jim Viner. The group was formed as a side-project by members of another 60s retro style group from Iowa City called the Bent Scepters. The latter group dissolved, or perhaps was transformed into The Diplomats with the addition of organist Basinger. The group's makeup is actually somewhat distinctive as retro groups like this go: most are either guitar oriented surf-influenced affairs, or essentially organ combos, like Medesky, Martin & Wood, Soulive, or Sugarman Three. In the Diplomats, the organ and guitar share the spotlight, much as was the case with Booker T. and the MGs, featuring organist Booker T. Jones and guitarist Steve Cropper. Also, the Diplomats' keyboard man Basinger also plays other vintage instruments like electric pianos. While Booker T. and the MG's are the group one is probably likely to be reminded of by the Diplomats, they also gather their influences from lots of other styles that were around three and a half decades ago, from James Brown to the Ventures, and they are obviously having a lot of fun doing it. Like the classic groups of the past, the musicianship, especially Roberson's guitar, is not exactly virtuosic, but it's very unpretentious and effective. Perhaps the biggest standout in the group is drummer Viner who shines with his classy, understated sound, and rock-solid beat. He also understands what the long-time R&B players call "the pocket," playing just milliseconds before or after the beat to get the perfect groove going. And compositionally, the Diplomats' material is more interesting than one might expect for such groove-oriented music, with some departures from predictability. For those who lived through the 60s and remembered them, it's deja vu all over again, in everything from clothing styles to music. There is a raft of younger bands and apparently their fans, who were not even around back then, who now think that such sounds and styles are definitely cool. But musically, not many of them get it quite right. From the American heartland, The Diplomats of Solid Sound do get it right, including an abundant spirit of fun to the music. They combine infectious grooves, with tasteful musicianship, clever writing and a genuine and unpretentious attitude to make an album that can't help but make you smile and want to dance. For our sound quality grade, we'll give this CD very close to an "A." There is a little distortion on the guitar and occasionally on the organ, but otherwise, the CD sounds great, especially the drums. The sound is clean and bright, and the drums especially sound impressive. While the music sounds retro, we can be grateful that engineers Jason Tobias and John Svec did not try to duplicate the sonic deficiencies of old recordings, as has often been happening on records by other neo-retro groups. 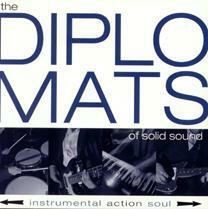 Whether you are someone who remembers the great old records by Booker T. and the MGs or are someone who read about the 60s in the history books and finds the current retro trend as being cool, the Diplomats of Solid Sound's independent release Instrumental Action Soul, is one of those albums you'll have trouble keeping out of your CD player.